WinZip Courier is a state-of-the-art file compression and encryption technology, Courier delivers the power of WinZip where it's needed most - your email system. This easy-to-use tool seamlessly integrates with your email application to automatically zip and protect outgoing files as you work. Simply write your e-mail, attach your files, and click Send - Courier does the rest. Because it works behind the scenes with Microsoft Outlook, Yahoo Mail, Gmail by Google, and Windows Live Hotmail, Courier takes the worry and frustration out of emailing attachments without adding any unnecessary steps. Courier automatically compresses your attachments into a single, small package before sending your email - all without any additional clicks. What's more, you can preview the contents of zipped email attachments directly in the Outlook preview pane. Couriers new preview functionality lets you see what's inside a Zip file attachment using a simple tree view. You can also double-click on a displayed file to launch its associated application for viewing, editing, or saving - all in one easy step. If you want to email a document, spreadsheet or presentation directly from Microsoft Word, Excel, or PowerPoint, Courier will zip and send these files without leaving the application or interrupting your workflow. Sending confidential information? Email messages can be easily intercepted as they skip across multiple routers, switches, and servers to reach their final destinations, putting any attached files at risk. Use Couriers 128-bit or 256-bit AES encryption to password-protect your attachments from unauthorized access. Courier combines strong encryption with temporary file wiping/shredding to ensure the security of attachments shared over email. 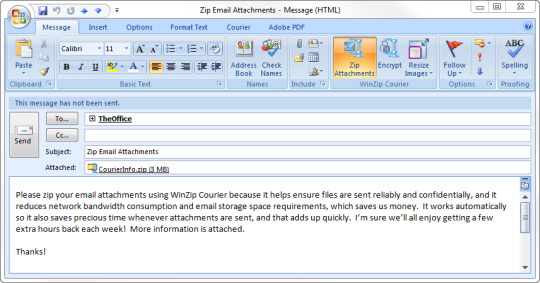 Harness the power of WinZip and start sending smaller, safer email - automatically. Try WinZip Courier today.